No. 34 Lower Camden Street, the location of the founding of Na Fianna Éireann in 1909, is one of the most significant addresses in the history of the Irish independence movement. It was also the birthplace of the Irish National Theatre Society, which went on to become the Abbey Theatre. Sadly this building has recently been lost to a fire under suspicious circumstances, and was then unfortunately demolished. The building was of such importance historically, and also architecturally, that An Taisce recently said that it had “all the criteria befitting a national monument”. the importance of no. 34 Camden Street as a centre of Irish revolutionary activity but evidence already exists in the ‘Bureau of Military History’ witness statements which confirm that fact. William Christian (Member of Fianna Éireann, 1911 onwards, Member Irish Volunteers 1915 onwards): “34 Lower Camden Street was used by the Irish Volunteers on many occasions”. Camden Street is one of the most historic streets in Dublin and, according to historian Máiréad Ní Chonghaile, it was “part of a medieval route from the southern suburb of Rathmines into Dublin city, the road then developed over the course of the 18th century lined with brick houses occupied by professionals and aristocracy often associated with nearby Dublin Castle. Today the streets exhibit a strong, 19th century mercantile tradition, with their bustling mixture of shops, service providers and market traders”. It is likely that the building at 34 Lower Camden Street was constructed in the mid-to-late 18th century for a local wealthy family; it is doubtful the original inhabitants were aristocrats but probably associated with one of the flourishing trades of the time. Following the ‘relocation’ of the upper class professional families from Camden Street to the outer, more fashionable, parts of the city in the early 19th century, the rooms above most premises were divided into tenement rooms. No. 34 was itself divided into a number of dwellings on the two upper floors and had a ground floor commercial unit with an attached small hall located to the rear of the building. It hosted a variety of businesses and trades throughout the years. I was unable to ascertain what businesses were operating in the building but I do know that it was a provisions merchants’ towards the end of the 19th century and it later played host to the local post office from the 1940s onwards. The small hall located at the back of the building is where the history comes alive. In 1902 a local amateur drama group known as the ‘Irish National Dramatic Company’ and run by W.G. Fay and his younger brother Frank, rented out this. This little-known drama group began to gain popularity and went on to become the ‘Irish National Theatre Society’, which was the precursor of the modern day Abbey Theatre. A number of popular productions were held at 34 Camden Street, including W.B. Yeat’s “A Pot of Broth” in 1902 and many notable characters of the Irish drama scene, including Maud Gonne, Lady Gregory, Maire Nic Shiubhlaigh, were involved with the theatre at Camden Street. The real significance of no. 34 Lower Camden Street came into being on August 16th 1909 when Countess Markievicz (above) took up a lease on the hall for a new national boy scouting organisation that she and Bulmer Hobson had started. The new organization became known as the Irish National Boy Scouts or Fianna Eireann and many credit this group of young boys and its dedicated nationalist leaders as being the pioneers of the Irish independence movement. This pivotal moment in 1909 was to herald in a new era of Irish advanced nationalism. The Fianna scouts were the first organized nationalist group to be armed and sufficiently trained. It provided credibility, and optimism, to the emerging revolutionary movement. The importance of the Fianna and their contribution should not be ignored in the historical narrative of the independence period, particularly in this ‘Decade of Centenaries’, which has so far completely snubbed the efforts of Countess Markievicz, Bulmer Hobson, Con Colbert, Liam Mellows, Padraig O’Riain and other key members of that ground-breaking organization. For many Irish people, the revolution only began with the founding of the Volunteers in 1913 but the efforts of Na Fianna Eireann should not be disregarded. Former Fianna Chief of Staff Eamon Martin said that “no history of the resurgent movement, which preceded and culminated in the Rising and no history of the Rising itself can claim to be complete if it ignores or fails to adequately acknowledge the enormous contribution made by Na Fianna Éireann to the struggle for our country’s freedom”. Over 100 boys attended that first meeting of the Irish National Boy Scouts on 16th August 1909. Future revolutionaries, who later came to prominence in such organisations as the Irish Volunteers, Cumann na mBan and the IRB, were present at this original meeting. Characters such as Con Colbert, Countess Markievicz, Eamon Martin, Bulmer Hobson, Sean McGarry, Helena Moloney, Pat McCartan and Padraig O’Riain were present that August evening in 1909. The meeting was a success and all the potential recruits who turned up enrolled for the new organisation that night. Fianna Éireann, as an organization, went from strength to strength and within a few months had formed several other branches across the city and soon had national branches in Limerick, Waterford, Tralee, Belfast, Clonmel, Tuam, Wexford and other provincial towns. Over the following years Camden Street was used not only by the Fianna but also by other nationalist organizations. Irish Republican Brotherhood meetings were regularly held here, drilling of Irish Volunteers took place in the hall, it was the first training venue for Cumann na mBan in 1914, lectures by prominent republicans such as John MacBride and Tom Clarke were held here and the Irish Citizen Army even used it for training purposes. Sean O’Sullivan (Member of the Irish Republican Brotherhood in Manchester and Dublin, and of the 4th Battalion Irish Volunteers): “I joined the 4th Battalion Unit of the Irish Volunteers in 1918. The Volunteers were under the command of Acting Commandant Kelly. On return from Armagh we continued the weekly parades, drill, etc. On the formation of the Engineers’ I was transferred to them under Captain Sean McGlynn. We generally met in 34 Camden Street. The training of the Engineers consisted chiefly of lectures and the use of explosives, road blocking, demolition of railways and bridges”. Bulmer Hobson (Member of the Supreme Council of the Irish Republican Brotherhood, Founding member and general secretary of the Irish Volunteers, Founder of Fianna Éireann): “I told the Countess Constance Markievicz of the organisation which I had founded some years before in Belfast, and she suggested that a boys’ national organisation should be started in Dublin on the same lines. On my explaining that the chief difficulty was one of money, she said that she would rent a hall at her own expense. This she did, the hall chosen being in 34 Lower Camden Street, Dublin, formerly the home of the Irish National Theatre Society. Notices convening a meeting of boys to be held at 34 Camden Street on the following Monday (16th August) to form a National Boys’ Organisation to be managed by the boys themselves on national non-party lines appeared in “An Claidheamh Soluis” on 14th August, 1909, and in other papers at the same time, and the meeting was duly held in that place and on that date. About one hundred boys attended in addition to Countess Markievicz, myself and some other adults”. James Tully (Member of 3rd Battalion, Dublin Brigade, 1919+, Member of ASU 1921): “I joined the I.R.A. in February, 1919, and was attached to the No. 3 Company, Engineers. There was no Engineer Battalion at the time. No. 3 Company was attached to 3rd Battalion of Dublin Brigade. Liam Archer was O.C. of the Battalion at the time and Mick McEvoy was O/C of the Engineer Company. During 1919 our activities were mostly confined to training. We trained at No. 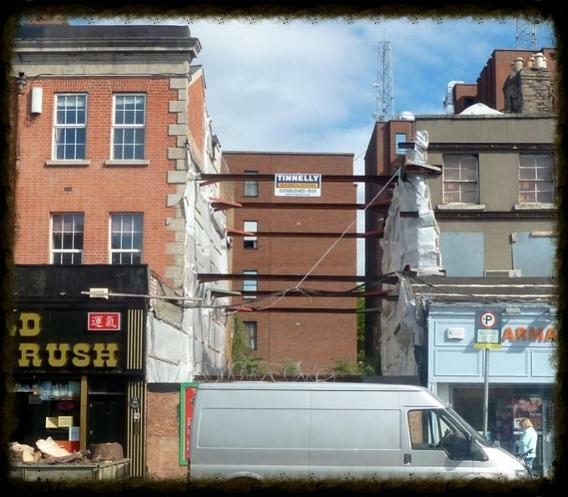 34 Camden Street where we drilled and received lectures on demolitions; methods at derailing trains; destroying bridges and felling trees”. Garry Holohan (Member of Fianna Eireann and senior officer 1909-22): “I remember Major MacBride gave a lecture to the Fianna in the hall at 34 Camden Street on his experiences in the Boer War, and I was greatly impressed by it”. George Joseph Dwyer (Member of 4th Battalion, Dublin Brigade): “Working side by side with the activities connected with the procurement of arms were special classes for training N.C.Os., which were held at 34. Camden Street. These were conducted by Captain Harry Murray and Vice Commandant Peadar O’Broin. These classes were held twice a week (1919). I was Section Commander at the time and was sent down to (34) Camden Street to undergo this special instruction. Our instruction consisted of rifle drill, squad and company drill, with lectures on the rifle and other military matters. When it was decided that I had received sufficient instruction I was returned to my squad (‘F’ Company, 4th Battalion, Dublin Brigade) to train them in a similar manner”. Sean Kennedy (1st Lieutenant of C Company, 1st Battalion, Dublin Brigade, Irish Volunteers): “I remember on occasions being detailed for duty outside 34 Camden Street while members of the Irish Republican Brotherhood were meeting and drilling inside (circa 1911)”. Seamus Pounch (Member of Fianna Eireann, Brigade Adsjutant Dublin Brigade 1918-20): “Towards the end of 1909 I joined An Cead Sluagh of the Fianna or National Boy Scouts of Ireland. The object of the Fianna was the establishment of the Independence of Ireland. Each boy on joining had, to make the following declaration: 'I promise to work for the independence of Ireland; never to join England’s forces, and to obey my superior officers'. To attract recruits a boy stood outside the Hall at 34 Lower Camden St. with a flag and answered queries and directed boys inside. The flag was green with a harp on it, but later the Fianna got its own flag, which was sky-blue with a sunburst and the words 'Fianna Eireann' inscribed on it. Many joined and fell away, but those who remained formed a close comradeship and became the nucleus of the Irish Army and were destined to see a free Ireland, the hope and aspirations of centuries. The leading figure, of course, was Countess Markievicz, who provided the rent of 10/- per week for the sole use of the Hall, 34 Lr. 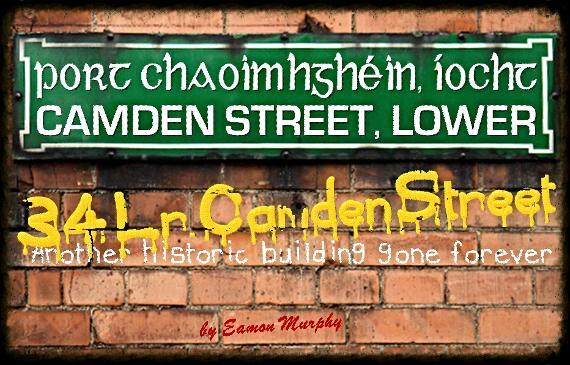 Camden St., for the Fianna”. Charles O’Grady (Member of Fianna Eireann, Irish Volunteers, 4th Battalion): “I enrolled in the Irish Volunteers at the meeting in the Rotunda Rink, November 1913. Sometime later I was told to parade at 34 Lr. Camden St., a hall at that time used by Fianna na hEireann, of which I had been a member. We were divided into companies and I was allocated to C/Coy. Battn. IV. We paraded on Thursday nights at 34 Camden St. and at Larkfield, Kimmage, on Saturday evenings for field exercises, company and battalion drill”. Patrick Egan (Sgt. and Lieut. “C” Coy. 4th Battalion Dublin Brigade 1916; O/C. Battalion Communications post 1916): “We joined the Fianna early in 1913 at 34, Lower Camden Street and were drilled by Con Colbert and Barney Mellows”. George White (Member of ‘C’ Company 3rd Battalion Dublin Brigade from 1917 onwards and Quartermaster A.S.U. Dublin from 1921 onwards): “I joined C. Company, 3rd Battalion, Dublin Brigade of the Irish Volunteers about June 1917. Joe O’Connor (Holy Joe) was commandant of the 3rd Battalion. Parades were held weekly at 41 York St. and 34 Camden St”. Seamus Kavanagh (Member of Irish Volunteers from 1913 onwards, Signal Officer 3rd Battalion. Dublin Brigade 1917-1918, Captain ‘C’ Company, 1921): “Being now a staff Lieutenant and responsible for the training of the signallers in the different Companies of the Battalion, for which I used the hall at 34 Camden Street (1918)”. Molly Reynolds (member of Cumann na mBan from its inception in 1913): “Shortly after the formation of [Cumann na Ban in 1913] it was decided that we should learn drill and marching. As no room in Harcourt St. [the headquarters of the Inghinidhe na hÉireann Branch of Cumann na mBan] was large enough for this purpose, Madame Markievicz gave us permission to use the Fianna Hall at 34 tower Camden St. on one or two nights a week”. Seamus Kavanagh (Member of Fianna Éireann since 1909, Captain, H/Company, 1st Dublin Brigade, Irish Volunteers and I.R.A. ): “From 1909 until the end of 1920, we attended, on an average, twice weekly meetings at 34 Camden Street where we received instruction, and attended lectures on Irish history. In the earlier stages, I was detailed to give instruction to units which had been formed at 34 Camden Street”. (N.B. Seamus was born in Liverpool and is not to be confused with the other Seamus Kavanagh who was also in the Volunteers around the same time but was born in Dublin). Annie O’Brien (Member of Cumann na mBan 1915-1924): “Cumann na mBan, Inghinidhe Branch met alternately at 34 Camden St. and 6 Harcourt St. We had the lectures on First Aid, arms classes, etc. in Harcourt St. and the drill in Camden Street”. Patrick Ward (Member of Fianna Éireann 1909-1913, Member of ‘B’ Company, 3rd Battalion, Dublin Brigade, 1914 onwards): “I remember on one occasion, I think the year might be about 1913, Major McBride was invited to give a lecture in the hall, 34 Camden St. He agreed, and gave a lecture dealing with the warfare of small nations against their oppressors with, of course, the background of the Boer War as material”. Alfred White (Quarter Master General Fianna Éireann): “The method of organisation of the Scout movement, just then founded by Baden-Powell in England, was adopted; but with an Irish and military basis. Its coming was heralded in the July 1909, number of An Claidheamh Soluis by a note, written by P.H. Pearse, recommending attendance at a meeting to be held in 34 Lr. Camden St. to found Fianna Éireann. In August 1909, Pearse announced that at the meeting Constance de Markievicz had been elected Chief Scout, and Padraic Ó’Riain, General Secretary”. Eamon Martin (Founding member of Fianna Éireann 1909, Member of Provisional Committee and Executive of the Irish Volunteers, Chief of Staff of Fianna Éireann 1916 onwards): “Accordingly, I went to the [first Fianna] meeting which was held in what I learned later was a small Theatrical Hall at, 34 Lower Camden Street. The first [Fianna] group, called An Céad Sluagh, was formed from this gathering and met at the Camden Street Hall”. Peadar O’Mara, William Christian, Michael Lonergan, Barney Mellows, Liam Mellows, Con Colbert, Bulmer Hobson, Countess Markievicz, Padraig O’Riain, Paddy Ward, Christopher Martin, Eamon Martin, Fred Mellows, Sean Saunders, Sean Kennedy, Seamus Pounch, Charles O’Grady, Patrick Egan, James, Willie, Leo and Theo Fitzgerald (brothers from Pearse Street), Percy and Frank Reynolds (brothers), Harry and Leo Walpole (brothers), Garry and Paddy Holohan (brothers), Brian Callander and Bob Holland. One of those who attended the first Fianna meeting was Michael Lonergan. He went on to be a senior officer of Fianna Eireann before he moved to the USA in 1914. In 1948 in a letter written to the Bureau of Military History he stressed the significance of the hall at Camden Street. He said that “the first meeting to organize [the Fianna] was held in a hall at the rear of 34 Lower Camden Street. This place should really be designated some kind of a national shrine for it was there that things actually started”. 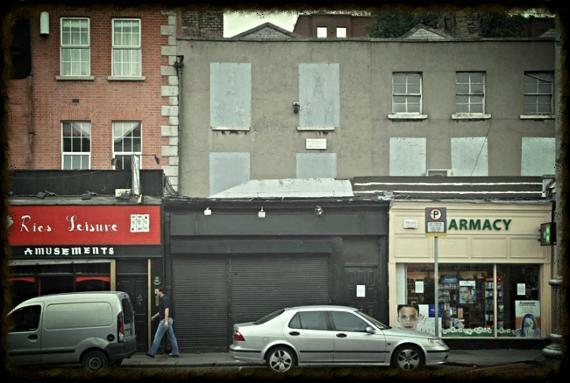 As far as I know no efforts were ever made to ‘list’ or preserve the building at Camden Street. In the 1940’s, 1950’s and 1960’s many ‘Old Fianna’ parades used to march past the hall in recognition of its contribution in years gone by. In April 1950 a special parade was held on Camden Street to honour Countess Markievicz’s role in the foundation of Fianna Éireann. Eamon de Valera also placed a wreath on the door of the building to pay respects to the memory of Markievicz. The building at that time housed a Post Office and was still in reasonable condition. I visited the building on several occasions in the last few years (2007, 2008 and 2009) but it was by then abandoned and in a fairly derelict state. I even attempted to enter the building to see the condition inside but was unsuccessful. I wasn’t able to determine who owned the building either, despite numerous calls to Dublin City Council (DCC). On December 12th 2011 I discovered that the building and three adjoining buildings were sold for €770,000 to an as yet un-named developer. The developers then encountered difficulties gaining planning permission for their proposed development on the site, plans which included an amusement arcade and apartments. Fast forward to April 5th 2012 and James McMahon, DCC Engineer for Dangerous Buildings, inspected the buildings and deemed the buildings structurally unsound, and liable to fire and/or collapse. Two days later, yes TWO days later, Dublin Fire Brigade was called out at 1.30am on April 7th (not even two days later, a day and a half really) to a report of flames coming from the roof of no. 34 Camden Street. Due to the efforts of Dublin Fire Brigade the fire was eventually extinguished and didn’t spread to adjoining buildings. However, the damage was so great to no. 34 that it was subsequently demolished. Questions must be asked as to the circumstances of the fire and coming so soon after it was declared unsafe and liable to collapse at any stage. The fire also occurred less than four months after a developer purchased the building, with plans to redevelop them. I can’t say I know all the facts so I have to be careful what I say but surely questions must be asked about these circumstances, if only to rule out any possible doubts. An Taisce - The National Trust for Ireland - has said that: “The destruction of such a historic and culturally significant place presents a serious threat to Dublin’s continued status as a UNESCO City of Literature – a status shared by only 3 other cities, and monitored continually. Heritage tourism is of increasingly essential importance to Ireland’s economy. Given both major historical connections, the site must be understood as a National Monument, and is of comparable importance to no. 16 Moore Street. This site qualifies as a National Monument under several criteria, and is of far too great significance to be left demolished – where the only vision for the birthplace of the nation’s cultural renaissance is of a slot machine hall. An Taisce is now seeking to persuade the State to buy the site under a compulsory purchase order, declare it a National Monument, reinstate the building, and list adjacent Georgian buildings on the Record of Protected Structures”. It was a sad day for Irish history when no. 34 Lower Camden Street was lost. However the site itself is still of importance so hopefully something can be done to create a memorial fitting to the young pioneers of this country.